Mexico, Sweden, Canada, Israel, China, Italy, The United States, Jews, Catholics, Mormons, Methodists, Baptists, Muslims, Hindus, Lutherans, Episcopalians, Barack Obama, Jehovah’s Witnesses, NASA, Presbyterians, Homosexuals, Abortion, and all those who consider themselves Eastern Orthodox. As of this writing, they have released no official statement concerning the existence or intensity of anger felt by the Almighty toward the Amish, Scientologists, or third season of Dexter. One of the most striking features of their Internet presence is the “Parodies” section of their website. Here, marginally talented congregants reinterpret popular hit songs by Queen, John Denver, Garth Brooks, Creedence Clearwater Revival, and Lady Gaga. In fact, the list is so extensive it would appear that copyright laws are also amongst the numerous items that displease the Lord. The effectiveness of this unique “music ministry” is debatable, but I can tell you that after sitting through their butchered version of Leonard Cohen’s Hallelujah I was certainly convinced that someone should burn in Hell. But even their Internet presence, as compelling as it is, has not focused as much attention on the group as their picketing activities. With an admitted travel budget exceeding $200,000 per year, the group visits all fifty states to protest everything from parades to funerals. 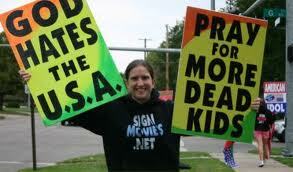 They tote signs adorned with saying like “AIDS Cures Fags” and “Thank God for Dead Soldiers.” In fact, it is their attitude toward the later which has placed them in the center of an epic battle that has the potential to shift the very foundation of free speech in this country. 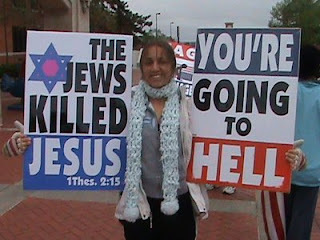 Because they believe that each U.S. combat death is a direct manifestation of God’s anger toward America’s lax stance on homosexuality, they gleefully celebrate this “holy judgment” with a macabre assortment of offensive signs. As is their routine, church members constantly scour the Internet for listings of funerals for American servicemen and servicewomen. They then notify the local authorities, post their intention to picket at said funeral on their website, and then hop on a plane with signs in tow. Once they arrive at their destination, they strategically place themselves along public thoroughfares where they will be visible to mourners and residents. By shrewdly refraining from actually harassing mourners at the funeral home or even setting foot on cemetery grounds, they ensure that their actions do not violate the Respect for America's Fallen Heroes Act which prohibits protests within three hundred feet of a National Cemetery during a ceremony. Their legal dexterity is no accident, as eleven of Pastor Phelps thirteen children have law degrees and one of his daughters often represents the congregation in litigation. 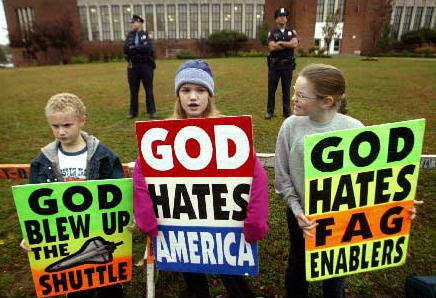 On March 10, 2006, Westboro members arrived in Westminster, Maryland to protest the funeral of Marine Lance Corporal Matthew A. Snyder. Fortunately Matthew’s father, Albert Snyder, was given enough advance notice to reroute the funeral procession and ensure that none of the mourners encountered the group from Westboro during the journey to the graveside. There was, however, no escaping the local media coverage of the protest which Albert felt had irrevocably tainted the burial of his fallen son. Snyder was so incensed by the actions of Westboro and its pastor that he took them to court, and in October of 2007 he was awarded $5 Million for “intentional infliction of emotional distress” and “invasion privacy” amongst other things. 2. In 1977’s National Socialist Party of America v. Village of Skokie, the Supreme Court ruled that a Neo-Nazi group had the right to peacefully march through the streets of Skokie, Illinois while brandishing signs adorned with swastikas. The National Socialist Party chose Skokie because it was a predominately Jewish community and, at that time, the home of several Holocaust survivors. The court decided that while the Nazi group’s actions were unimaginably offensive and hurtful, they did not constitute a “clear and present danger” to the citizens. I will be the first to admit that Westboro’s situation has created the cruelest of ironies: An organization that exploits America’s unique freedoms to desecrate the funerals of the very people who make those freedoms a reality. I cannot fathom the outrage felt by the family and friends of these fallen heroes when they are subjected to the detestable tactics of this hate group masquerading as a religious organization, but it is equally difficult for me to fathom reducing the personal freedoms that protect them. We are in the unique position to shape the legacy of Westboro; either we allow them to collapse under the unsustainable weight of their own misguided hatred or place them in the history books as an organization that incited emotional reactions powerful enough to shift the very moorings of our Constitution. 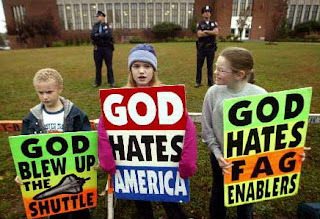 If there is one thing that I am absolutely convinced of, it is that Westboro does not deserve the honor being labeled as martyrs (legal, religious, or otherwise) and if we start fining or imprisoning them for their picketing at funerals that is exactly what they will become. When it is all said and done, Westboro congregants would insist that their only goal is to remind the rest of the world that God gets pissed when human beings misrepresent His sovereignty with their actions. I have a feeling that one day soon, no will be able to attest to that more than them. Is Divorce a Career Choice?